Holbein included two globes, one terrestrial and one celestial, in his most famous painting "The Ambassadors". The terrestrial globe was based on a globe made to celebrate Magellan's circumnavigation of the world in 1522 (see Magellan's Globe). 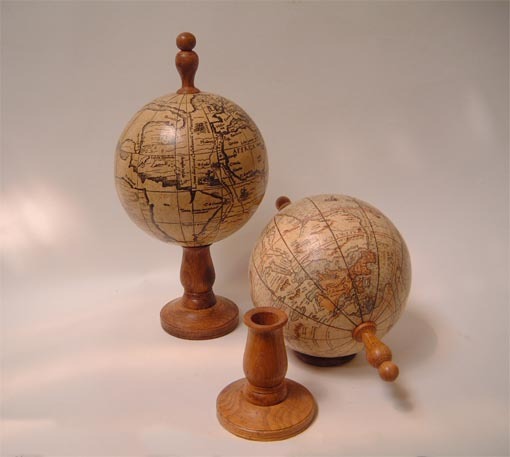 Magellan Globe and Holbein's Globe. 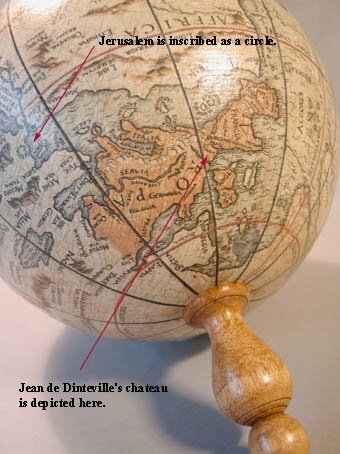 Holbein made many changes when painting the Magellan's globe into the painting, one of which was to include the chateau of his patron Jean de Dinteville. He also inscribed Jerusalem as a circle, not only to portray it at the center of the known world, as was the tradition with early world maps, but also because Jerusalem aligns with other key objects found in the painting (see "Hidden Meaning" below). We have made this terrestrial globe as if it has been plucked from the painting. Made with a hollow plaster sphere, twelve paper gores and hand turned wooden handles, it is 17cms in diameter. We also provide a separate hand turned wooden stand. Each globe comes with a booklet detailing the making of this unique globe and relevant socio-historical information (the current booklet does not include the sections below). Price for our Holbein Globe: Ref:GT 1533 £165 + delivery. * This price is for globes purchased within the UK and European Community. interesting aspects surrounding "The Ambassador's" painting. There are few objects which are pulled from paintings into this three-dimensional reality and then reinserted back into a canvas again! 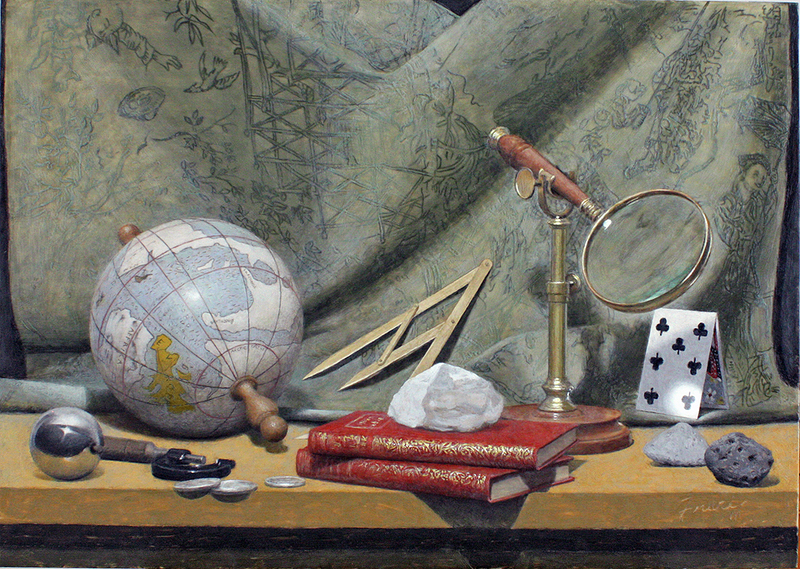 Recently artist Kevin Frank went full circle and used our Holbein globe as the subject of his painting, you will not find a poor Damien Hurst rendition of art here, Kevin like Holbein is a true master and embraces light and exactness and precision - something most artists aspire to but clearly never attain. Watch this space for future publication news! Text copyright 1999 Greaves & Thomas. London.